Winx's top-rated victory came April 14th in the G1 Queen Elizabeth Stakes, the mare's 25th win in a row. Australia's superstar mare, Winx, returns to the spotlight this Saturday at Randwick, where she'll be chasing an Australian record 26th consecutive victory and a 19th win in Group 1 competition. Thirteen potential rivals have entered the G1 Winx Stakes in what will be Winx's first start since tying Black Caviar's record of 25 straight wins April 14 in the G1 Queen Elizabeth Stakes. Saturday's field features five previous Group 1 winners, some of whom are stablemates in the Chris Waller barn. He could send out as many as six in the Winx Stakes. The Winx Stakes was previously called the Warwick Stakes and was a G2 event won by Winx the last two years. This year, the event was elevated to a Grade 1 and renamed. Among Winx's competitors will be Ace High, winner of the Victoria Derby earlier this year. Ace High won a barrier trial over Winx last week. 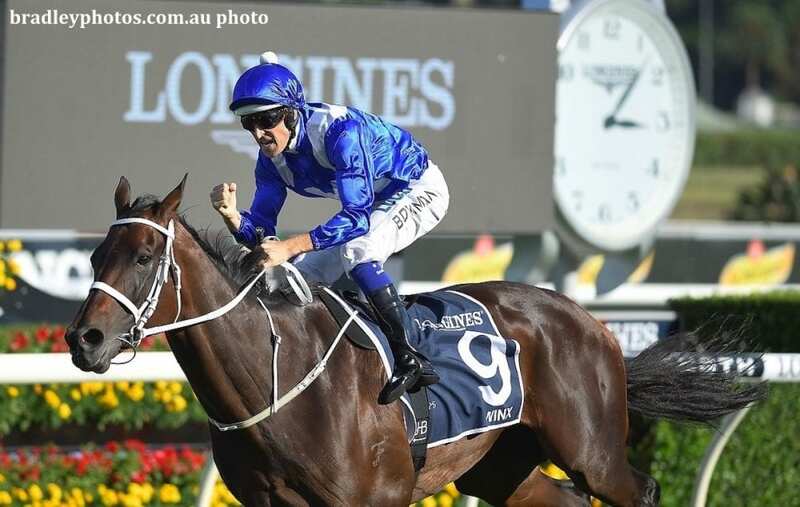 Winx's performance in the Queen Elizabeth has placed her atop the Longines World's Best Racehorse Rankings with a rating of 130, one point ahead of Gun Runner's victory in the Pegasus World Cup. This entry was posted in NL Article, Racing and tagged Australian racing, Black Caviar, chris waller, hugh bowman, queen elizabeth stakes, randwick, winx, Winx Stakes by Paulick Report Staff. Bookmark the permalink.